Place High Conservation Value Forests in secure National Parks for the survival of threatened species and the protection of water quality and carbon sinks. Conserve degraded forests as Future Forests where their ecological values can be restored over time and opportunities for research and education can be provided. 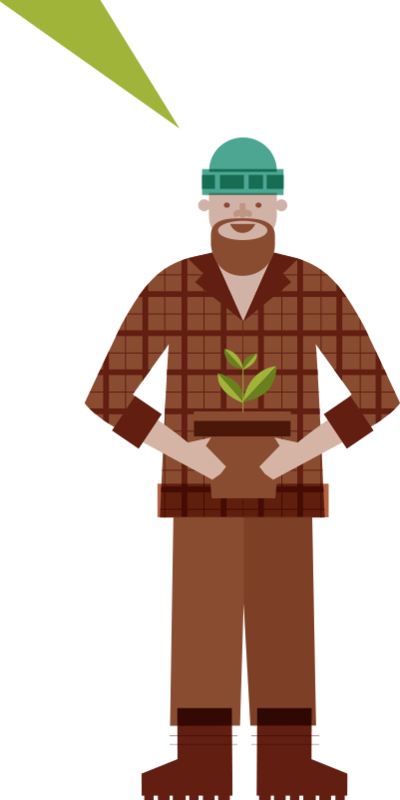 Farm forestry is the incorporation of commercial tree growing into existing farming systems. It produces timber, provides an additional income stream for farmers, creates regional employment and has multiple benefits for farming productivity and the environment. There has been a substantial amount of work done to develop farm forestry in WA and around Australia and there is a wealth of previous experience and technical knowledge to draw upon. Tree farming takes a long time to offer a return on investment and has traditionally had to compete for land with food production. Schemes such as the Managed Investment Scheme offered financial incentives for landholders and resulted in sharp increases in planting, but where the land wasn’t appropriate (in terms of soils, climate or distance to processing centres) the results were poor and in some areas this put a dent in the reputation of trees on farms. Scale and location are critical to success and our plan ensures that sufficient trees are planted within an economically viable distance of processing centres to be profitable. The Forest Products Commission (FPC) ran the successful Strategic Tree Farming program between 2006 and 2008 with a plan to grow 25 million trees for high value timber production in association with farmers in the Great Southern. The program was very successful with more than 25 million trees or just over 18,000 ha planted in 3 years and the 2009 - 2012 Strategy for Plantations and Farm Forestry set out a plan to expand the industry. In 2008 the Barnett Grylls Government was elected and reviewed the FPC as part of government wide efficiency drive, and funding for all new planting ceased. This was a blow to participating farmers, the industry and to WA’s moves to become self-sufficient in timber production. Forests For Life is working to ensure reinvestment, firm commitments and long-term planning. Thanks to funding from the Koorabup Trust and the State Natural Resources Management Program we engaged consultants to prepare a financial assessment of the FFL Farm Forestry and Landcare Plan. It is a detailed, cautiously presented report that makes recommendations on investment scenarios and finds that the plan is financially viable and will deliver a number of key co-benefits. We are now calling for tenders for the FFL Farm Forestry and Landcare Business Plan. Tenders are due by the 15th of February. Scope: 40,000 hectares of trees will yield 450,000 - 600,000 cubic metres of high quality structural or appearance grade sawlogs per year. Tree species: Stage One of the Financial Assessment, will provide for the final determination regarding species. The Program's aim is to produce a substantial volume of high value timber within 25-35 years and to maximise ecological benefits consistent with this objective. Preliminary information suggests that Fast-growing, proven farm forestry species Eucalyptus saligna, E. cladocalyx, E. tricarpa and Corymbia maculata as well as potential for Pinus pinaster and P. radiata are strong candidates. We are keen to use native species if feasible. Location: Two regions – the South West zone and the Great Southern zone – defined by a distance of not more than 100 kilometres by road from future processing centres proposed for Greenbushes and Albany. 20 000 hectares of farm forestry in each region is equal to approximately 3 per cent of each zone's cropping and grazing land (where trees would be strategically incorporated into food production). See preliminary maps below. Environmental: Participating farms will have land care work done as a part of the programme, with a focus on riparian zone rehabilitation and salinity and erosion control. The project also has substantial climate and wildlife habitat benefits. 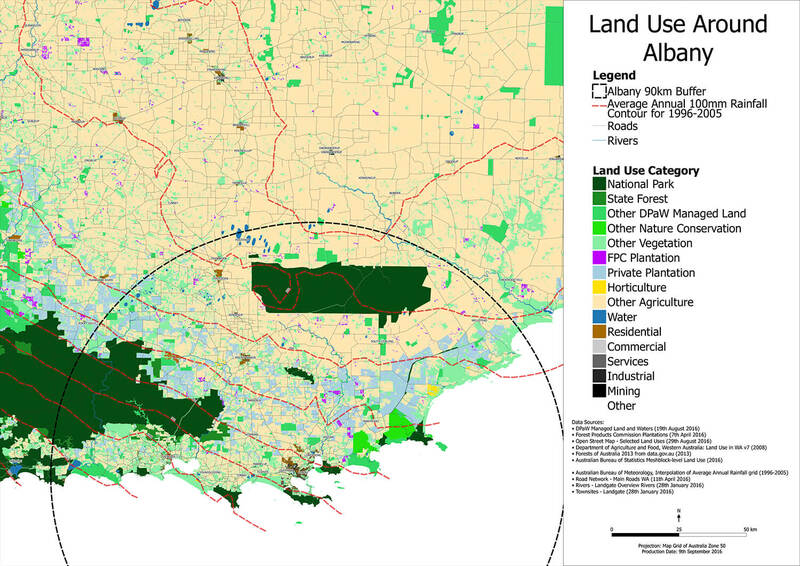 Target area of 4000 ha of landcare work. Long-term socio-economic studies show that farm forestry generates significant employment with 0.2 jobs per 100 hectares before the farm gate, 0.30 - 0.45 / 100 hectares in harvesting and transport and 1.45 / 100 hectares in high value processing. The project will create 1.95 - 2.1 jobs / 100 ha = 780 - 840 jobs in timber production plus an additional 80 - 100 in land care. We are working with landcare, agroforestry, carbon market, farming and timber consultants and supporters to bring this plan to fruition. If you're interested in further details, have questions or support to offer, please use the contact us tab to get in touch. The State Government has recently released its softwood strategy (22nd Sept 2016), essentially planning to increase the pine estate by 10 000 hectares. Plantations are an important part of the timber strategy for the south-west and WA Forest Alliance welcomes the Barnett-Grylls Government’s recognition that the future is in wood grown on private land. The plan on its own is not sufficiently ambitious to meet WA’s timber needs and current issues with plantation management warrant attention prior to an expansion. The sector would benefit from updating its techniques to improve its environmental management planning, financial returns and social impacts. Aerial spraying of herbicides and erosion during harvesting have significant negative environmental and social impacts. It is also true that plantations can also have positive environmental implications when grown on cleared land and, for example, have been shown to improve water quality. The establishment of commercial tree plantations and revegetation in the catchment of the Denmark River (Western Australia) since 1987 has yielded significant improvement in water quality. In the absence of sufficient native food pine plantations have also become a major food source particularly for the endangered Carnaby’s Cockatoo. Forests For Life proposes an environmental, social and economic review of the State’s softwood plantation industry with a view towards improving environmental management, recognising and mitigating impacts on communities and improving the financial returns. 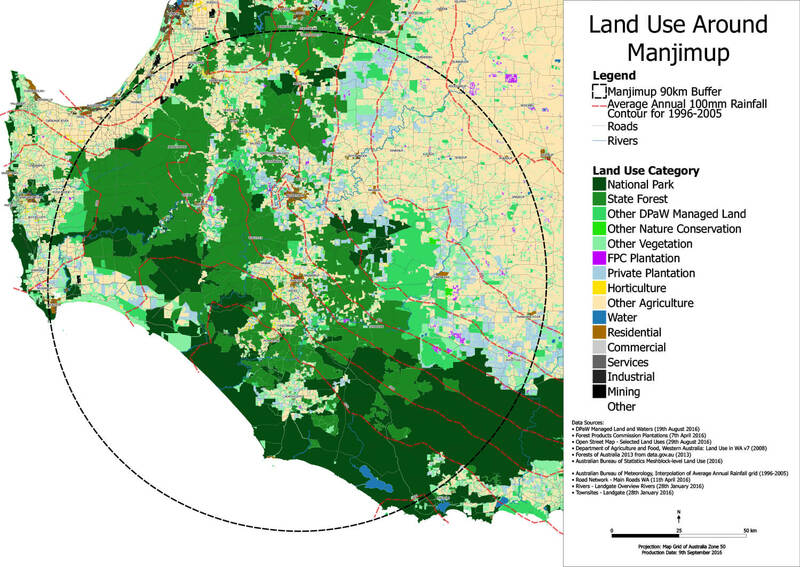 There are approximately 150 000 ha of bluegum (Eucalyptus globulus) plantations in the South-West and Great Southern. They are managed almost exclusively for woodchip export from Albany and Bunbury ports by a handful of private companies. Rotation times are relatively short (10 - 15 years) and silvicultural management is low compared to trees being grown for structural or appearance grade timber. Woodchips sell for approximately $150 / tonne. Depending on scale and distance to port, bluegum plantations have had mixed economic success. Approximately 130 000 ha of the south-west’s bluegum plantations are in the Great Southern region. In 2014, 1.4 million tonnes of bluegum woodchips were exported from the Albany port. It is anticipated that the industry will consolidate to less than 100 000 ha and reliably produce around 1 million tonnes per year. An 82-hectare site, the Mirambeena Timber Processing Precinct, adjacent to the Albany port, has been established to provide for value-adding of the region’s bluegum resource. Plans to establish an engineered wood product plant at the Mirambeena site failed in 2007 after the Western Australian company Lignor was unable to secure sufficient funds in challenging global financial circumstances. The company planned to use native forest timber as a part of its feedstock, which was criticised by environment groups and the WA Greens. Lignor claimed at the time that there was a preference for plantation karri closer to the processing centre but that native forest wood would be necessary to fill the supply gap while the plantations grew. The opportunity to capitalise on the bluegum resource by value-adding the timber locally to produce high value structural timber still exists. Forests For Life proposes an assessment of the current feasibility of a laminated veneer lumber processing centre for the Mirambeena site and, in the event that the proposal is considered feasible, for the report to make recommendations for State Government support and incentives. It is possible that the regional plantation supply of fast growing timbers would first need to be increased. Every year many hundreds of hectares of forests and woodlands in the South-West are cleared for mining, infrastructure and roading and much of the timber is either burned on site or sold for low value products like charcoal for silicon manufacture. The substantial volume of timber generated from clearing in the South-West could readily meet the needs of fine woodcraft artisans and micro millers. The largest, long-term and continuous supply comes from mine site clearing. Every year approximately 1000 hectares of jarrah forest are cleared for bauxite mining, principally by Alcoa and Worsley, companies which have leases guaranteed by State Agreement Acts until 2045 and 2046 respectively. Every year more than 100 000 tonnes of wood products from mine site clearing are sold by the Forest Products Commission, which manages the wood sales, and at least a further 80 tonnes per hectare are burned on site. See here: http://www.alcoa.com/australia/en/info_page/mining_air.asp). That amounts to a minimum of 80 000 tonnes of timber burned on site every year. “Local, interstate and international tourists are enchanted by our display of diverse items made locally using local timbers. This is a showcase for our forests. Our gallery provides an outlet for many fine woodworkers in the south-west. It gives them an outlet for their passion and talent and it shows the public the diversity for uses of local timbers transformed into useful items. Rosalind Piper, Director, Pemberton Fine Woodcraft Gallery, September 2016. Forests For Life proposes that the WA Government negotiate a financial agreement with the Federal Government based on the national climate mitigation benefit to be gained from protecting the State’s forests. Funds would be used to develop a management plan and to employ administrative and field staff to conserve and maintain intact ecosystems and restore biodiversity in degraded forest areas. See our climate section for details. Our plan’s benefits to the economy, the community and the environment are ready to be brought to life. We welcome your support in putting Forests For Life into action. The local communities, wildlife, timber industry, tourism, honey production, water quality, climate, cultural and recreational pursuits, to name but a few: ALL stand to benefit from this plan because ALL rely on the forests for their health and survival.